Stock market prices go up and down continuously. Stock market prices also trend up and down over longer periods of time. In recent weeks we've been seeing prices go down at a faster rate than up resulting in a trend downwards. This has resulted in plenty of press/blog inches from experts trying to explain what’s going on. In response to this my investing strategy is unchanged despite having lost, on paper at least, over £53,000 from my peak 2015 wealth valuation even after new contributions. That is multiple years of post FIRE spending and so not an insignificant amount of money. I continue to passively rebalance but importantly everything is done in slow motion and contains no ‘backing the truck up’ or ‘going all in’. 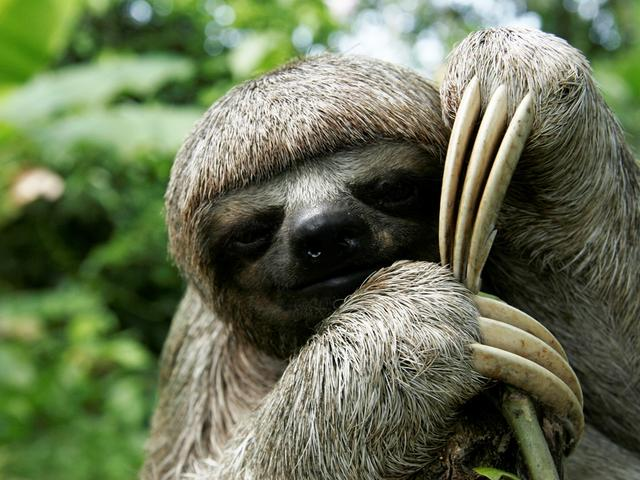 I think of it as investing at the pace of a sloth. I do this because even though there is lots of investing noise around I am very conscious that price down trends can occur for long periods of time. 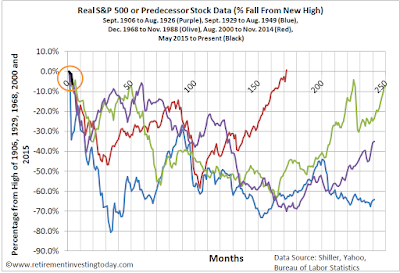 Let me demonstrate with a chart looking at US stock market price downtrends. 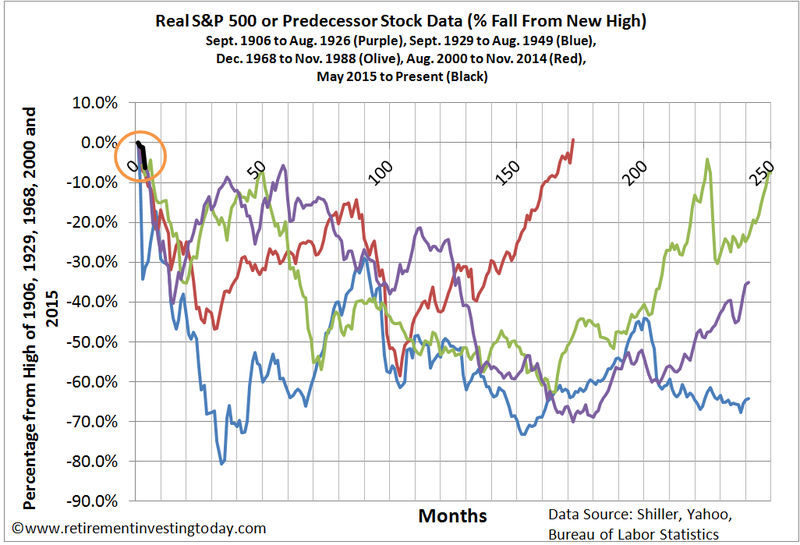 A new real (inflation adjusted) price high was reached in September 1906 which then led into the 1907 Bankers Panic (marked in purple on the chart). From the high it took until December 1920 to reach its real low of -70.0%. That’s 171 months or 14 years and 3 months for prices to bottom in real terms. A new real price high was reached in September 1929 which then led into the well known Great Depression (marked in blue on the chart). From the high it took until June 1932 to reach its real low of -80.6%. The decline to the real low was reasonably rapid at 33 months or 2 years and 9 months. What’s interesting with this period though is that even 20 years later the market was still more than 60% below the previous real high and didn’t actually reach a new real price high for more than 29 years. A new real price high was reached in reached in December 1968 which then led into the stock market crash of 1973 to 1974 which came after the collapse of the Bretton Woods system and also incorporated the 1973 Oil Crisis (marked in olive on the chart). This time from the real high it took until July 1982 to reach its real low of -62.6%. That’s a period of 13 years and 7 months. Finally, a new real high was reached in August 2000 which led us into the Dot Com Crash and before we could recover we were straight into the Global Financial Crisis (marked in red on the chart). Over this period the real market fell 58.6% by March 2009. That’s a period of 104 months or 8 years and 8 months. Markets can trend down a long way. This is no secret and talked about frequently. Markets can take a long time to reach bottoms after previous highs. This is less frequently discussed but an important point. So how do the falls of 2015 thus far compare. We had the real high in May 2015 and are so far down 6.2%. That’s a period of 3 months. I show this in black on the chart and because of its insignificance compared to the other examples shown have also marked it with a big orange circle. 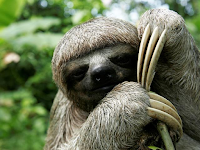 It reinforces why I’m happy to be an investing sloth. Inflation data from the Bureau of Labor Statistics. August 2015 inflation is extrapolated. Prices are month averages except August 2015 which is the S&P 500 closing price on the 28 August 2015. You are quite correct that the charts are not total return but simply based on the S&P 500 (or former equivalents). Your point about dividends being important is an important one and it's one of the reasons that I'm trying to get my portfolio to a yield of 3% before pulling the FIRE pin. 2.5% will be for me to live off and the 0.5% will be earmarked for reinvestment in the good times and to allow for a fall in dividend payments during down turns. The big lesson from your charts is that people who chatter about drawing only the natural yield (i.e. divis) from their pension funds really ought to decide whether they would be happy to see their capital values gyrate like that. I visit the MSE boards quite a lot, and am gobsmacked at how many people think they "should" be able to make a real 3% p.a. (or 4%, or 5%) from equities without much risk. Occasionally someone will enquire what they mean by "should", but answer comes there none. They're about as daft as the wild BTL enthusiasts. I suppose the biggest lesson of them all is that a fool and his money are soon parted. Don't really visit MSE anymore except to check best buy savings rates on the main site. Was thinking about 100% equities portfolio and those real %'s as a strategy though, so had a quick play on cFIREsim, which admittedly is US stocks so not like for like with the UK. Assumptions were drawdown rate increases with US CPI, expenses of 0.25%. If you're happy to deplete your portfolio to $0, over a 30 year period and want "100% success" then you're at a starting drawdown rate of 3.3%. If you want your portfolio to be an endowment for the family (ie perpetual wealth) so portfolio value in real terms equals starting portfolio value, again with "100% success" then you're at a starting drawdown rate of 2.3%. 4% fails (run out of wealth in less than 30 years) 8% of the time. 5% fails 16% of the time. Passive Investor's question is very important. Also - choose your index carefully - and know something about it . +15.2% 12 months Total Return. Your charts illustrate periods varying from 14,13,8 and 3 years from highs to lows . Over such long periods of time the constituents of the Indices will have changed significantly. For the S&P 500 I found a figure of just over 1000 representing the different companies that had been a constituent of this index over a 20 year period. up. So - in a way - the index makes it's own winners - although I think this effect must be very small unless there is significant turnover in the constituents. And - as RIT keeps reminding us - DYO Research. Sorry - the above comment has not appeared as I had wanted - the relative performance figures for the FTSE indices and different time periods should have appeared as a table for easier comparison. I recognise the symptoms - the pot is getting full, you watch the financials every day, you model the portfolio far to regularly and you are all too aware of downsides of what Mr Market brings every day. I have the same symptoms and the medicine to be taken every time it's needed is:-1) get out your strategy plan and ask if anything has changed - if not do nothing. 2) Measure your 12 month average return - if it's on plan do nothing. If its below plan give yourself a couple of months thinking time and then do nothing. 3) Review your plan in light of your goals - there's a different mindset for when the pot is full to when you are growing. Good to be 5.6% up over a year. You clearly cannot have too much ( if any ) in a FTSE 100 or FTSE All Share tracker - and /or little exposure to the poor performers that are included in the FTSE 100 . Plenty of FTSE 100 companies have performed well but unless you have individual company shares - the only way I know to help pick the winners and avoid the losers is in an actively managed fund or IT. So -pick your fund manager wisely too ! Is it unrelenting or just obsessive?